Last summer the Deltaville Marine Museum staged a retrospective exhibit of my artwork done over a 50-year period. 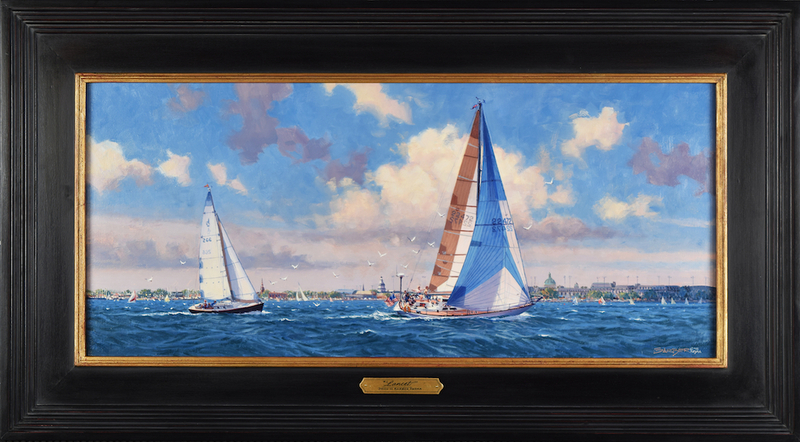 At the opening I met a local couple; Dr. and Mrs. Richard Rhame, who asked if I would paint their current sailboat. I met them at their home on the nearby Piankatank River and planned the painting. They are avid sailors and have raced under the burgees of the Annapolis and New York Yacht Clubs. Soon after, I met them on the Rappahannock River during an afternoon sail. I was on our chase boat and made many photos of the Rhame’s beautiful Lancet, an Alerion 28’ sloop. 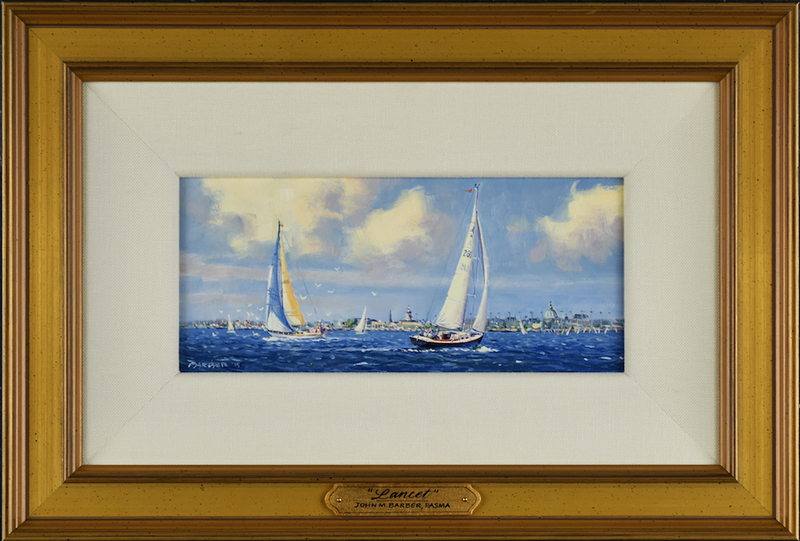 After the photo session it was decided that their earlier 42’ Baltic sloop, also called Lancet would be included in the background and the waterfront of Annapolis, Maryland would be on the distant shore. I did pen sketches showing the Alerion on different tacks with the Baltic beyond and once approved by the Rhames I did a small oil study. The sketches illustrate the composition of the painting to come and the oil study shows, in addition, the overall coloration of the piece. At this point we all had a clear idea of what the final painting would look like in miniature. After Jean and Rich pondered the oil study they chose to reverse the positions of the boats with the larger Baltic in the foreground. I drew the new scene and emailed the image to the Rhames who immediately approved the new composition and the final painting was begun. A few weeks later the major canvas was concluded and I emailed a photo. Jean and Rich were very pleased with the outcome. Frames were built and the oils installed and since I was in the area doing research for a new painting I hung the art for them. Rich’s first words were, “It’s better than perfect”! And I looked over at Jean, and with tears in her eyes she said, “That is us – sailing on our beloved Lancet. I can’t believe it”! In a following email she said, “I have never invested in anything that I loved more… I am still a bit overwhelmed”. Two days later I received the following brief message from her…“I still can’t stop crying. It is so beautiful!!! Am I blessed to be able to do this work and make people so happy? Yes I am! The final painting is oil on linen canvas measuring 12″ x 27″ with an overall, framed size of 18 1/2″ x 33 1/2″. Below are two preliminary sketches, the initial oil study and the final framed painting.